I saw these videos of JYJ the other day and had to post. One made me a little sad because Junsu kept talking about the current issues with broadcast stations not allowing JYJ to perform their songs, but the other was just so adorable and funny. The first is from Guerilla Date where stars discuss their new work and get to spend some time walking outside with their fans. But JYJ is so loved in Korea that they were unable to film at the predetermined location because there were too many fans O_O. [HANGUL] 진지하게. [ROM] Jinjihage. [ENG] Seriously. The second is from an advertising campaign with JYJ for Nii. I tried finding links for the clothing brand Nii, but it's difficult to find the clothes outside of Korea. I'll keep looking, but for now, enjoy this funny video of JYJ with the kids from the advertising campaign. The funniest part of the video above is when the cute little girl calls Junsu cute. Haha! Too adorable. There's a lot of controversy around the DBSK hiatus of the JYJ members. The Wiki entry on the DBSK clarifies some of it. I try not to focus on it but rather celebrate both parts of DBSK as they are currently promoting separately as JYJ and TVXQ. In the spirit of celebrating both parts of DBSK, I can't resist posting this very cute clip of Changmin and Yunho from a few years ago. 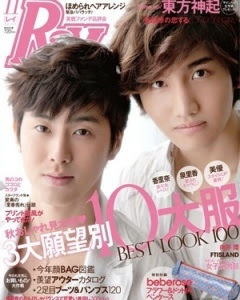 (Yunho DBSK leader + Changmin DBSK maknae = TVXQ). It's such a funny retelling by Changmin of something that happened to a game that Yunho was obsessively playing on this cellphone. I wish TVXQ and JYJ great success, always! As an aside, I purchased a copy of Ray Magazine yesterday and plan to post my review of the issue and some of the snapshots. To end on an awesome note, here is DBSK performing Love In The Ice live in Japan.